Burflex Scaffolding has completed the installation of more than 530 linear metres of scaffolding at Rampton Secure Hospital in Nottinghamshire for access to an extensive programme at the site including internal and external façades and roof refurbishment. “We were appointed by main contractor Balfour Beatty to install scaffold access around the building’s C and D wings to a height of 11 metres, providing five lifts that could be simultaneously used by the restoration workers on the project,” says Rich Fieldhouse, Operations Manager at Burflex Scaffolding. 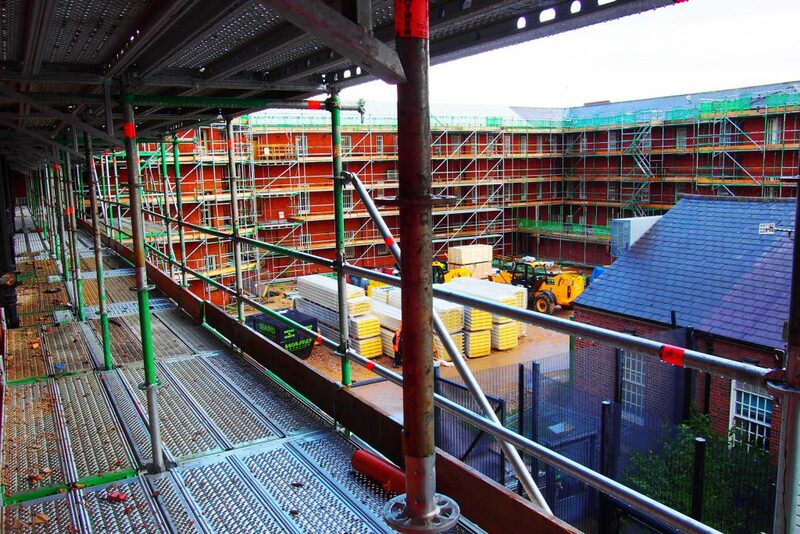 “Working with Layher, we were also able to specify ‘gap-fill decks’ which were installed between the standards rising from the decking platforms,” continues Rich Fieldhouse.